Last week I spent four days exploring Lodi California with Snooth and witnessed the unique wine culture that reflects this region. Over the next couple of months expect regular Monday posts describing this culture. But today I want to highlight the region's significance so here are a few basic facts available from the Lodi Winegrape Commission. The Lodi Appellation (American Viticulture Area) is the most prolific in California and accounts for 20% of all wine grapes crushed in the Golden State. According to the Lodi Winegrape Commission, "there are more acres of wine grapes planted in Lodi than all of Napa Valley and Sonoma County combined; in fact, more than the entire states of Washington and Oregon together, plus another 30%". 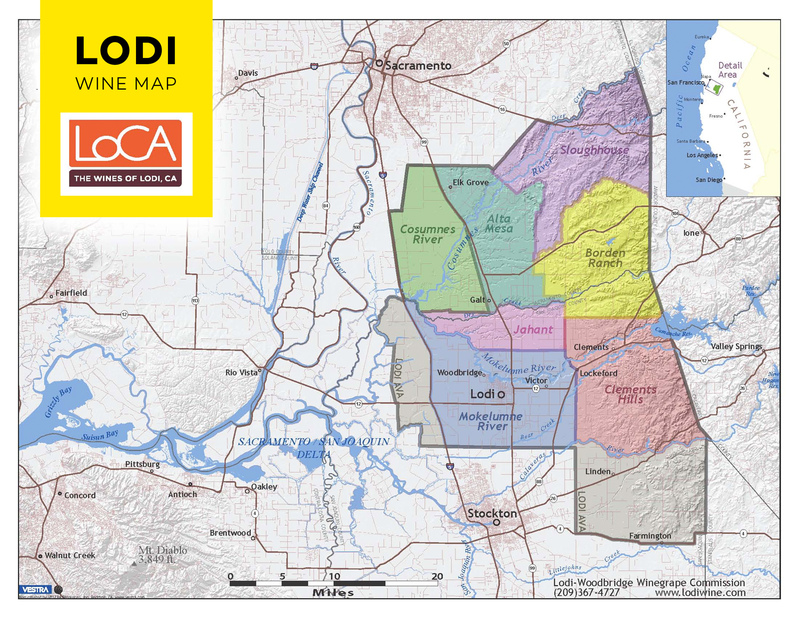 Thus, Lodi is arguably the most widely planted wine region in the entire U.S. and why the region is relevant to wine consumers. The Lodi AVA is located between the San Francisco Bay and the Sierra Nevada Mountains on relatively flat terrain. It enjoys a classic Mediterranean climate with warm days and cool evenings -- particularly when the "delta breezes" move in from the San Joaquin/Sacramento River Delta. Lodi's soils were formed millenniums ago as erosion from the Sierra Nevada mountain range were carried to the valley via the Mokelumne and Cosumnes rivers. In addition, the land adjacent to the Mokelumne River contain layers of sandy soils where Zinfandel vines were planted own-rooted a century ago. In the east, the closer vineyards are planted to the mountains, the soil becomes heavier in clay and stone. Lodi was heavily influenced by the California Gold Rush of 1849 as miners looked for farmland as an alternative to failed mining operations. Wine grapes were first planted in 1850 and in 1858 George West founded El Pinal Winery to become the region’s first commercial operation. Soon after several German families immigrated to the region from the Dakotas and their descendants are still growing grapes today - sometimes as 5th and 6th generation farmers. Along the way, Prohibition did not destroy the industry like in so many other regions as Lodi growers shipped grapes eastward for home winemakers (which was still perfectly legal). Post-Prohibition, wineries rebounded with old-vine Zinfandel becoming Lodi's unofficial signature grape. 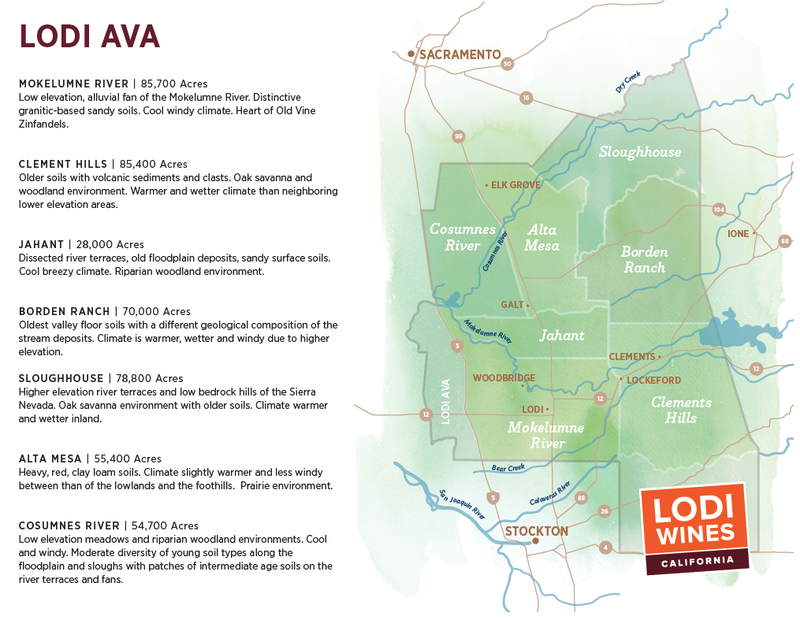 The Lodi AVA was created in 1986 and is located in the counties of Sacramento and San Joaquin. (TTB). 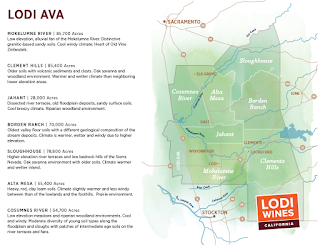 In August 2006, seven new AVAs were created within the broader Lodi AVA to allow wineries to differentiate among the geographic and climate variances: Alta Mesa * Borden Ranch * Clements Hills * Cosumnes River * Jahant * Mokelumne River * Sloughhouse. However, in general, Lodi winemakers continue to utilize the broader Lodi AVA designation on their labels in order to leverage and market the Lodi name. 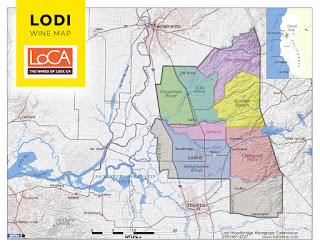 Lodi is predominately a red winegrowing region, with approximately two-thirds of the acreage dedicated to red grape varieties. In fact, Lodi is the "self-proclaimed Zinfandel Capital of the World" producing over 40 percent of California’s premium Zinfandel. And these are old-vine zinfandel with the oldest plantings dating back to 1888. More recently, however, Cabernet Sauvignon has overtaken Zin as the most widely harvested grape -- with many going into the bulk wine industry. Yet, the real story is Lodi's grape diversity with over 100 varieties crushed into wine with half of these German-Austrian varieties planted by Mokelumne Glen Vineyards. Other notable grapes we will cover are the Spanish grapes Albariño, Verdejo, Graciano, Tempranillo, and Garnacha; the Italian grapes Barbera, Aglianco, Sangiovese, Teroldego, Fiano, and Vermentino; and the southern Rhone grapes Cinsault, Viognier, Syrah, Picpoul Blanc, and Clairette Blanc. You can follow the Lodi Wine story here. Cheers.